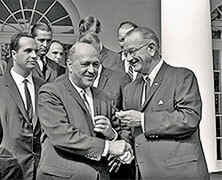 Robert Weaver became the first Black appointed to a presidential cabinet when he was named to serve as the Secretary Department of Housing and Urban Development President Lyndon B. Johnson. The department was newly created and he was thus its first Head. Weaver grew up in Washington, D.C. and graduated from what is now known as Paul Dunbar High School. He then entered Harvard University from which a B.S., an M.A. and a Ph.D. in economics. He served as an advisor to President Franklin Roosevelt and was named to direct federal New Deal programs. He was appointed Administrator of the Housing and Home Finance Administration by President Kennedy and then selected by Johnson to become a member of his cabinet. He later became the President of Baruch College in New York City in1969 and then became a professor of Urban Affairs at Hunter College in New York. Weaver died on July 17, 1997. A commemorative stamp of Martin Luther King, Jr. is issued by the U.S. Postal Service on January 1, 1979. The stamp is a part of the USPS Black Heritage USA commemorative series. The Dr. King stamp was the second in the series, the first having honored Underground Railroad conductor Harriet Tubman issued a year prior. 1873 – P.B.S. Pinchback Steps Down. P.B.S. Pinchback relinquished the office of Governor of Louisiana. Pinchback assumed the governorship while serving as the Lieutenant Governor when impeachment charges were filed against the incumbent Republican governor, Henry Clay Warmoth. Pinchback served for 35 days, finishing out Warmoth’s term. Pinchback was the 24th Governor of the state. 1913 – Delta Sigma Theta Founded. Delta Sigma Theta Sorority, Inc. was founded on this date in 1913by 22 Howard University undergraduate students who had earlier been initiated into Alpha Kappa Alpha. The 22 members were unhappy with the direction AKA was moving in and formed and incorporated a new sorority. The sorority now has more than 1,000 chapters and more than 300,000 members.